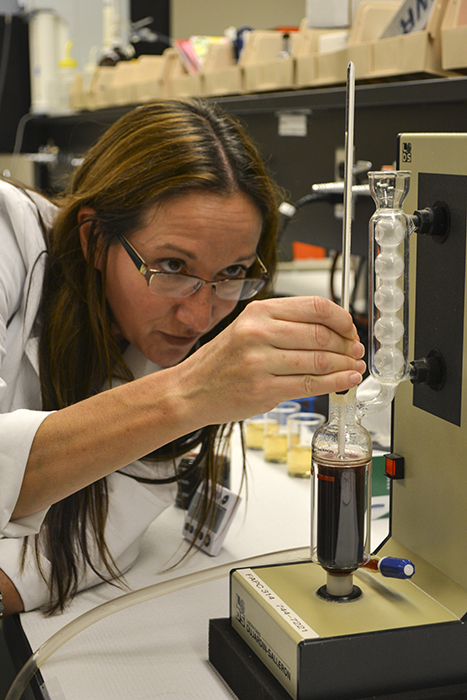 Angie Lathrop, FAPC analytical services research specialist, tests wine in the lab. Oklahoma was the No. 4 grape-growing region in the country from the late 1800s to the turn of the 20th century. During Oklahoma's seven land runs, many Europeans immigrated to the state, built houses, and planted gardens and vineyards. However, they were unable to sell the wine they produced when Oklahoma adopted prohibition along with statehood in 1907. Flash forward to 2000. Three wineries existed in Oklahoma. Today, there are more than 60. The resurgence in the state's grape and wine industry is attributed to the passing of State Question 688 in 2000, allowing wineries to offer samples and sell wine from their tasting rooms. Oklahoma State University's Robert M. Kerr Food & Agricultural Products Center is credited with strengthening the quality of Oklahoma wines and increasing overall wine sales. For several years, FAPC, a part of OSU's Division of Agricultural Sciences and Natural Resources, has undertaken a wine-quality project aimed at sensory and chemical testing of Oklahoma wines. Under the direction of William McGlynn, FAPC horticultural products processing specialist, continuing work and education have helped alleviate some of the state's vineyard and wine problems. "Oklahoma wineries were invited to submit samples of their wines for evaluation," McGlynn says. "Standard quality tests were run on each of the submitted wines at FAPC's Analytical Services Laboratory. The tests evaluated wine properties such as acid content, sugar content, alcohol content, color and various stability characteristics." McGlynn says the big advantage is for winery operators to know the chemistry and sensory analysis of their wines and how they compare with other wineries in the state. This research benefits wineries, vineyards and consumers. "The old saying goes, 'Great wine is made in the vineyard,' and it's true," McGlynn says. "Only high-quality fruit can make a high-quality wine, and the information gleaned from this project will better equip Oklahoma grape growers to produce the highest quality fruit and product possible." Canadian River Vineyards and Winery, in Lexington, Oklahoma, has participated in the wine-quality project and uses Oklahoma-grown grapes to consistently make award-winning wines. The winery recently won a double gold award at the 2016 Indy International Wine Competition. Nearly 3,000 wines from around the world were entered in the competition held August 3-4, 2016, at the Purdue Memorial Union in West Lafayette, Indiana. Canadian River's Chocolate Drop Dessert Wine emerged victorious. "Chocolate Drop wine is made from merlot and is a cherry-chocolate dessert in a glass," says Gene Clifton, owner of Canadian River Vineyards and Winery. "Our riesling, which is made entirely of Oklahoma-grown grapes, was awarded a bronze medal." Clifton is proud to see Oklahoma wines compete on an international level. Canadian River wines have won medals in six international wine competitions in 2016. "We only wish all Oklahoma vineyards and wineries would take advantage of the analytical services and educational opportunities available at FAPC, OSU and Redlands Community College (El Reno, Oklahoma) to improve Oklahoma grape and wine quality," Clifton says. "At Canadian River Vineyards and Winery, we are proud to make award-winning wines from Oklahoma-grown grapes." This is not the first time Canadian River has been in the spotlight. It was featured at the 2013 and 2015 Wine Forum of Oklahoma. "Oklahoma vineyards and wineries were asked to submit their wines to FAPC for a chance to participate in the forums," McGlynn says. "Canadian River Vineyards and Winery was selected as a top wine and featured during both years." Attendees could taste state-produced wines, and Canadian River Vineyards and Winery presented and discussed its products during a Made in Oklahoma session. "Participating in the Wine Forum gave us the opportunity to pour and talk about Oklahoma wines in front of a national audience," Clifton says. "We also were able to meet and talk to winemakers from other states." Sponsored by OSU's School of Hotel and Restaurant Administration and College of Human Sciences, the fifth biennial Wine Forum of Oklahoma will take place April 7-8, 2017, in the new north wing addition to the College of Human Sciences. "Vintners from around the world will be featured during the Gala Vintner Dinner and Auctions on April 7 and at seminars and a Grand Tasting on April 8," says Karen Fraser, event coordinator for the Wine Forum of Oklahoma. FAPC has partnered with the Oklahoma Wine Forum since 2013 and is excited to participate again in 2017, says Andrea Graves, FAPC business planning and marketing specialist. "We always enjoy reaching out to local wine producers and working with them to help better tell their story and educate forum participants about wine produced in the state. We also hope to introduce several Made in Oklahoma food companies that pair well with Oklahoma wines." Pending final details, McGlynn plans to teach forum participants some of the technical details of how to make wine, particularly as they relate to the challenges and hurdles faced by local grape growers. "Oklahoma is a difficult place to grow grapes, but the state's grape growers and winemakers are committed to producing high-quality fruit juices and wines proudly made using Oklahoma-grown grapes," McGlynn says. For more information about the Wine Forum of Oklahoma, visit wineforumofoklahoma.com or email wfok@okstate.edu.